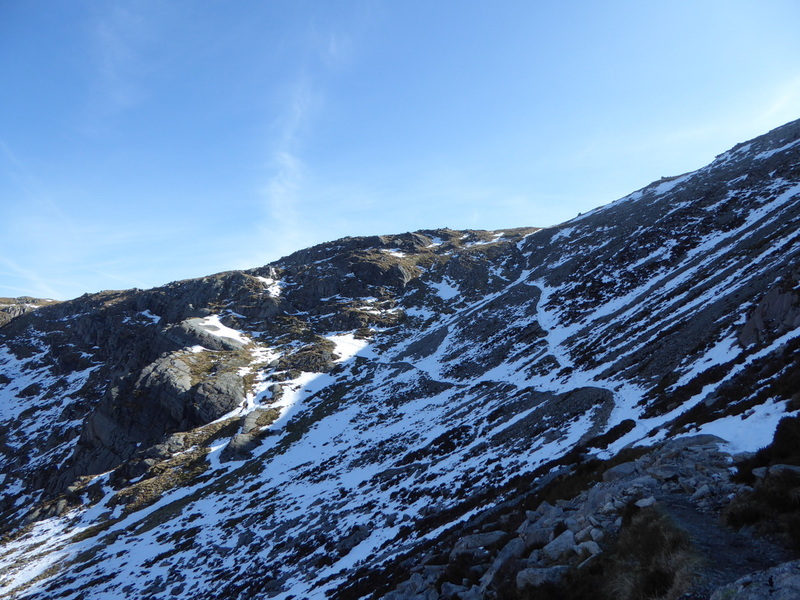 Generally good mountain paths however above 400m the paths were covered in snow which was sometimes quite deep. 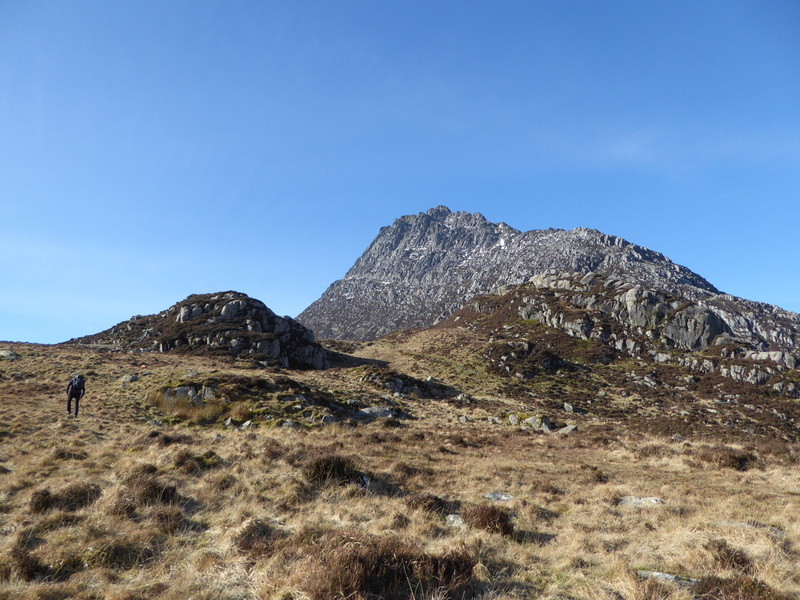 Care should be taken on both the ascent and descent of the South Ridge of Tryfan. 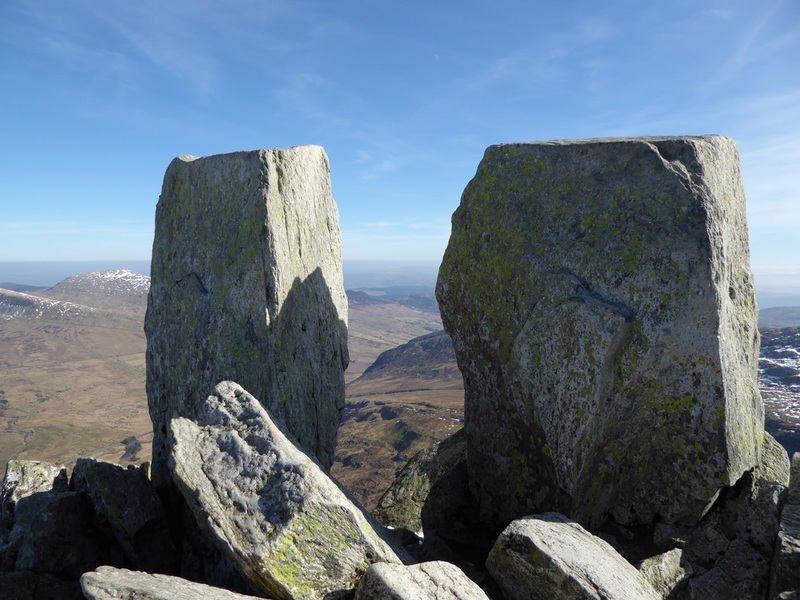 The summit of Tryfan is mainly large boulders and is also extremely confusing in mist & cloud. 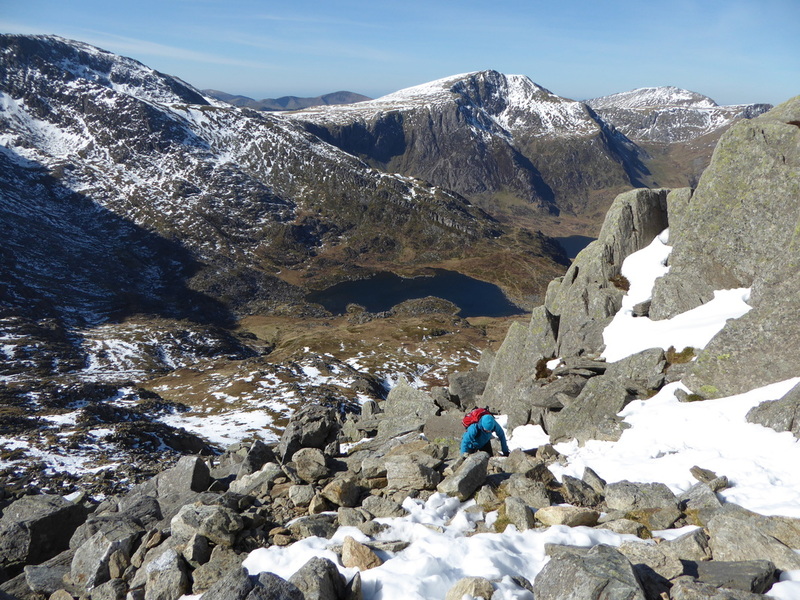 Any ascent of Tryfan never fails to disappoint. 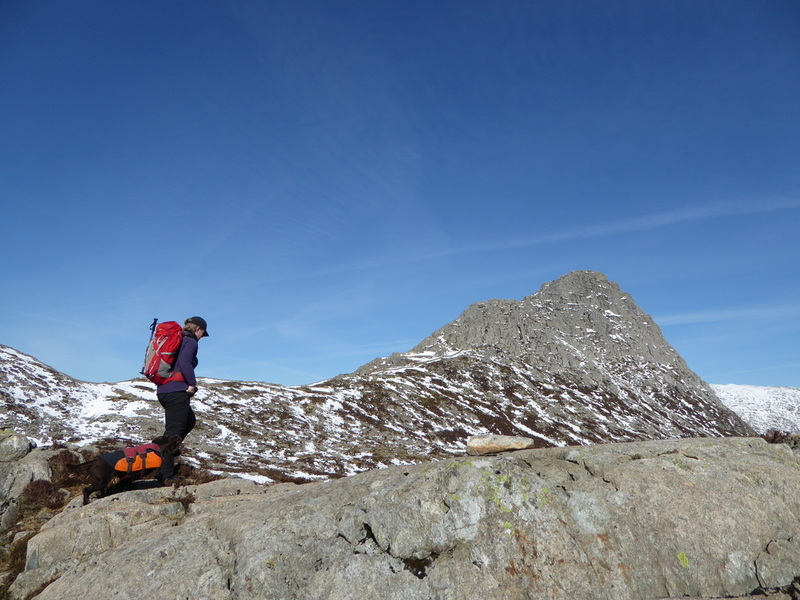 It is a truly exceptional mountain - full of intrigue, rocky gullies and scrambling. 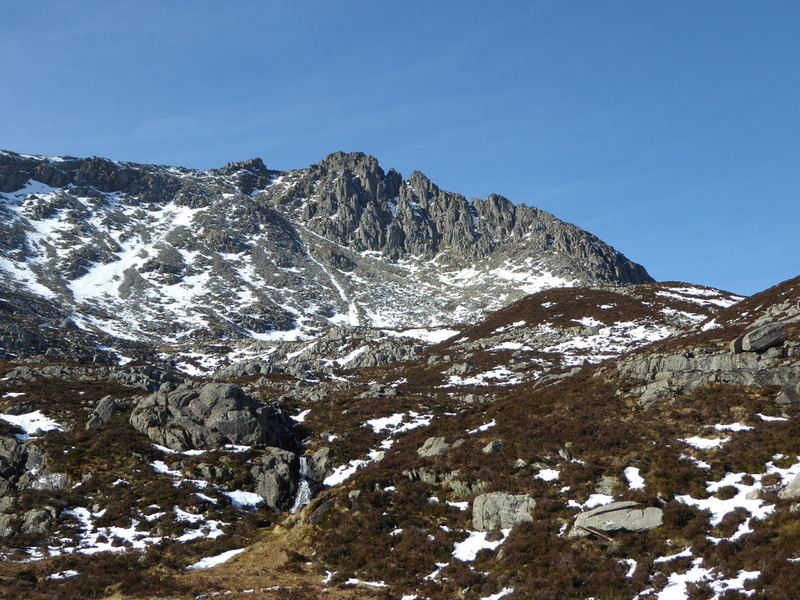 Just looking at it as you approach from either end of the A5 makes you want to stop and climb it. 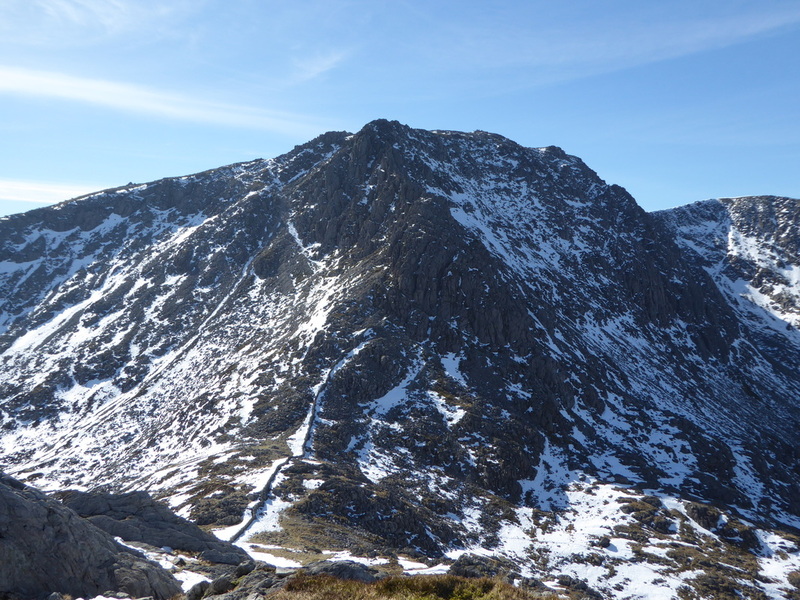 We had climbed the mountain before - usually via Heather Terrace or straight up the North Ridge which are both excellent days out. 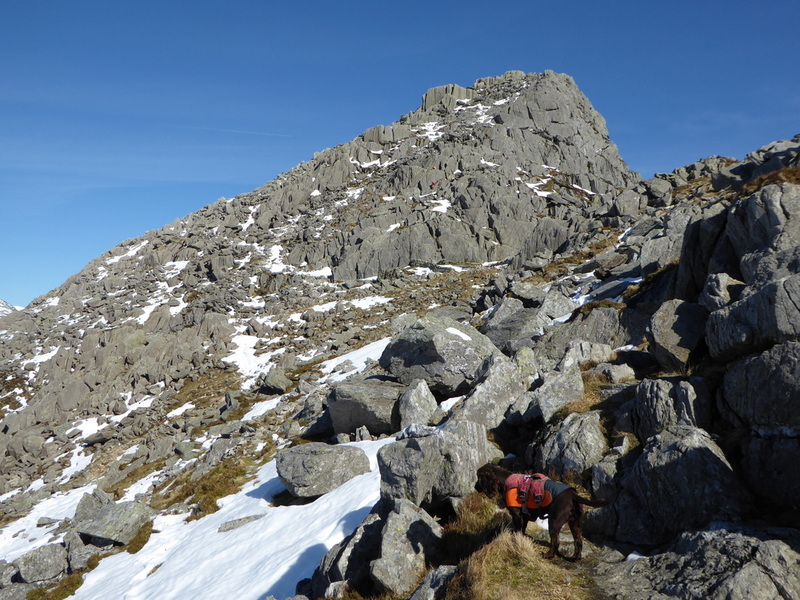 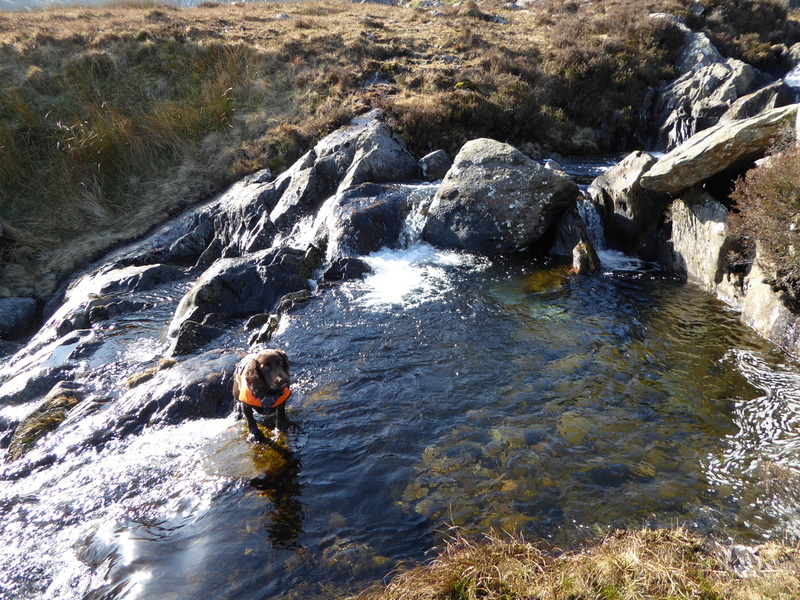 This time, as we had our dog Fudge with us we would be ascending and descending via the somewhat easier South Ridge which we had only ever used as a descent in the past - it is still a challenging route up with lots of scrambling and interest to keep you entertained. 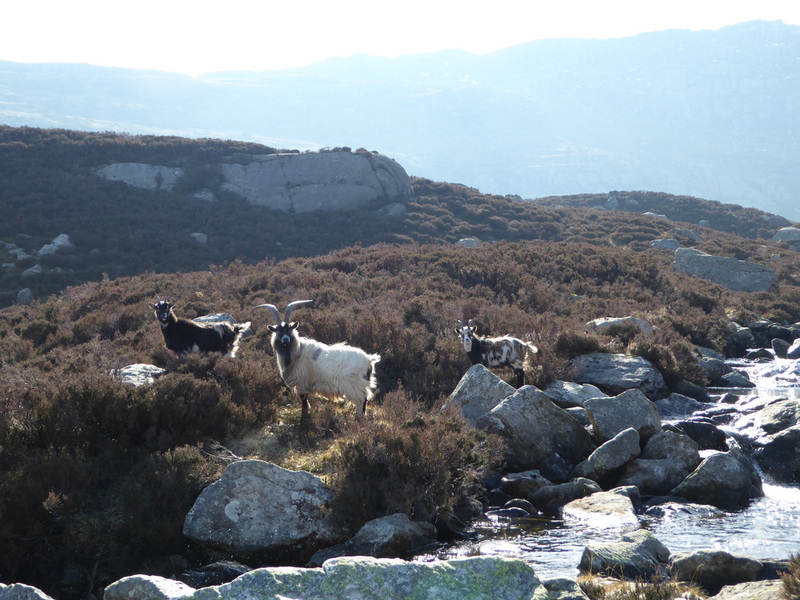 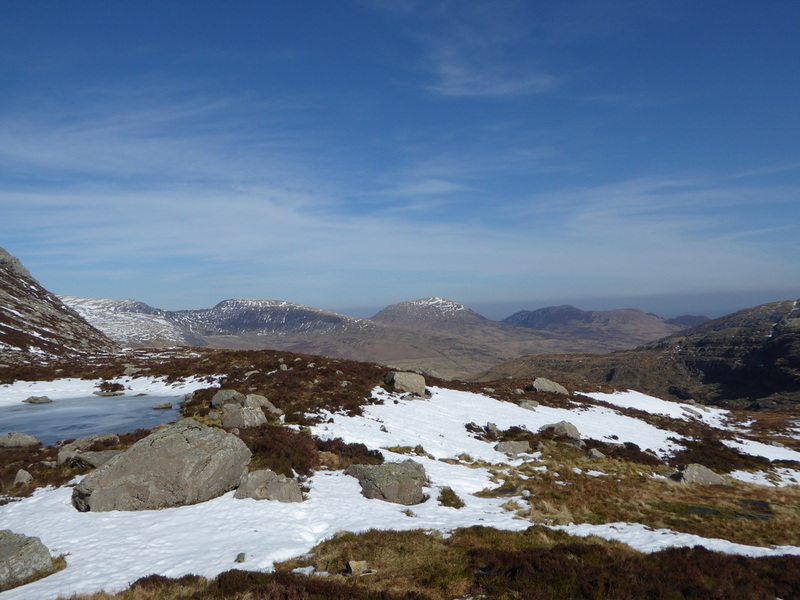 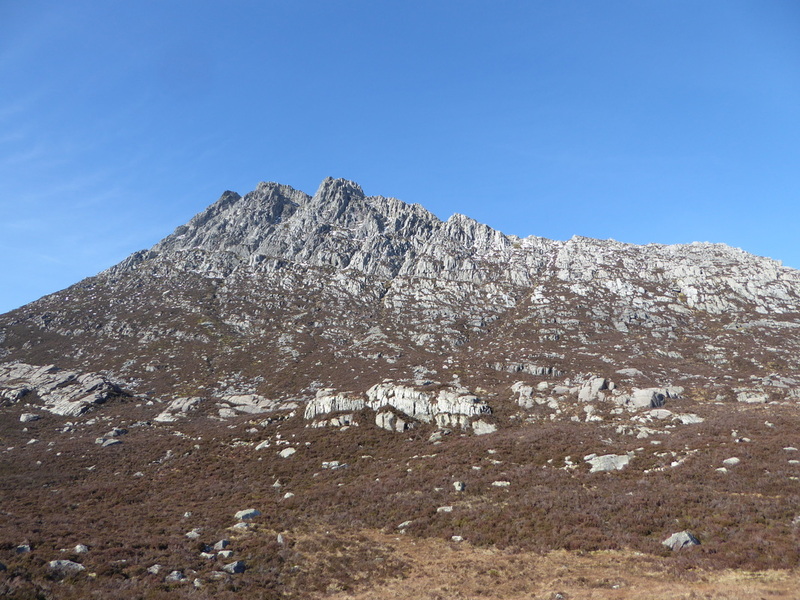 From Tryfan we also intended to visit the Welsh Nuttalls of Y Foel Goch & Gallt yr Ogof. 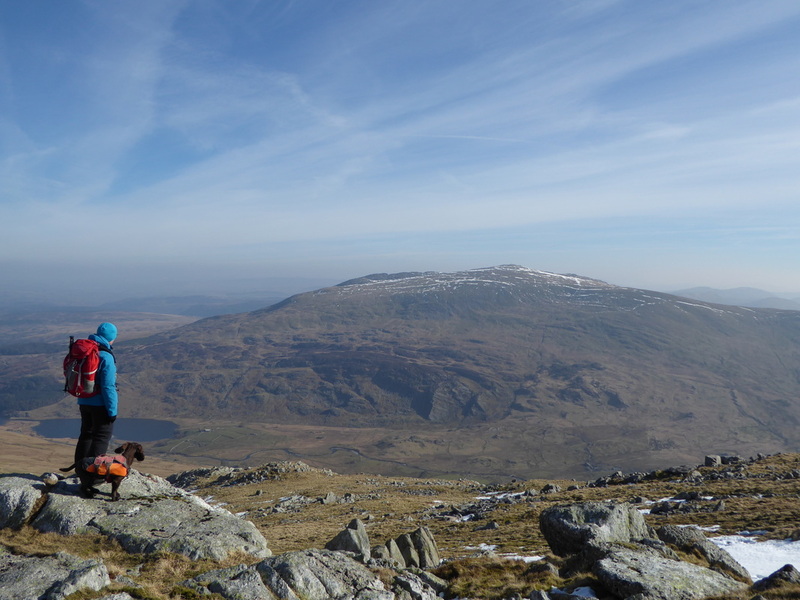 Therefore after a hearty fuelling breakfast at the Moel Siabod Cafe on the A5 in Capel Curig, we were ready for what hoped to be a memorable day out. 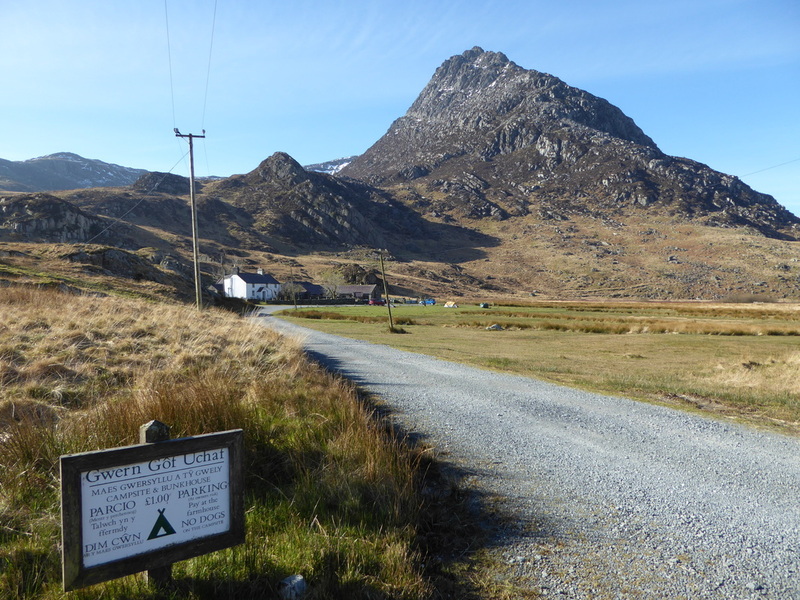 The walk started from the farm at Gwern Gof Uchaf where there is plenty of parking during the week although this can be busy at weekends. 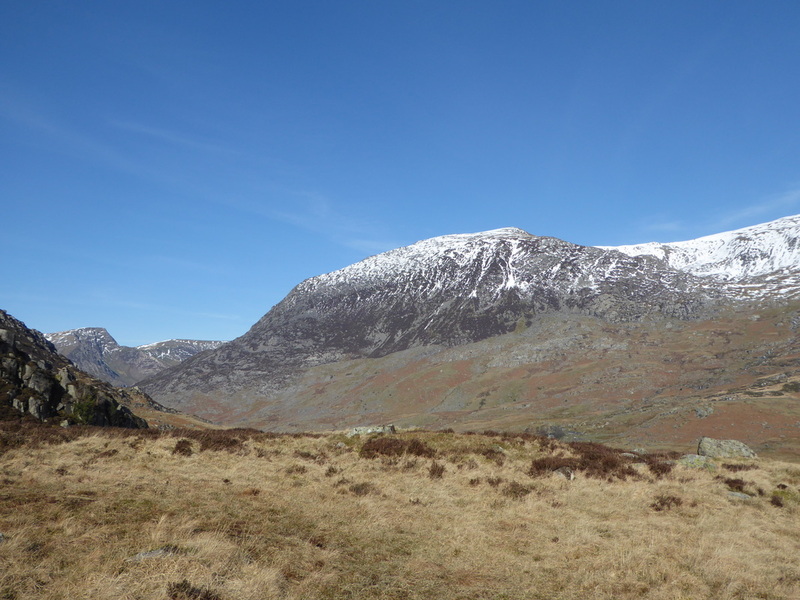 There is parking just along the A5 but we felt safer leaving our car off the road therefore broke the bank for the very competitive £1 all day parking fee. 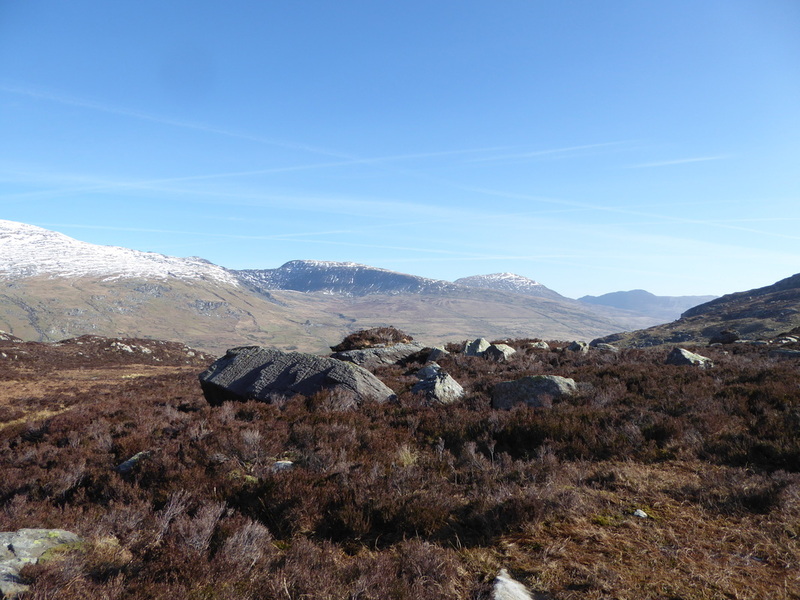 The farm sits in a superb amphitheatre with the Carneddau and Glyderau providing the seating. 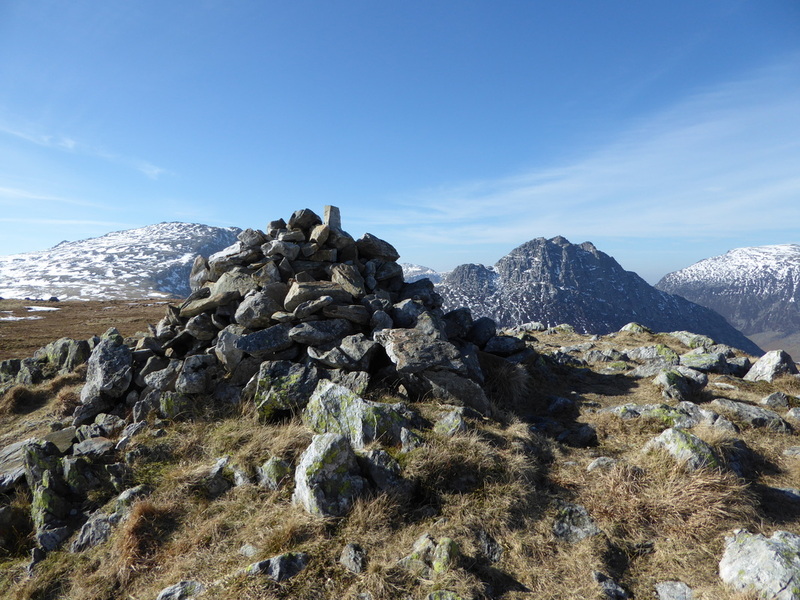 Leaving the parking area, a stile to the left of the farmhouse gave access to a path which headed into Cwm Tryfan. 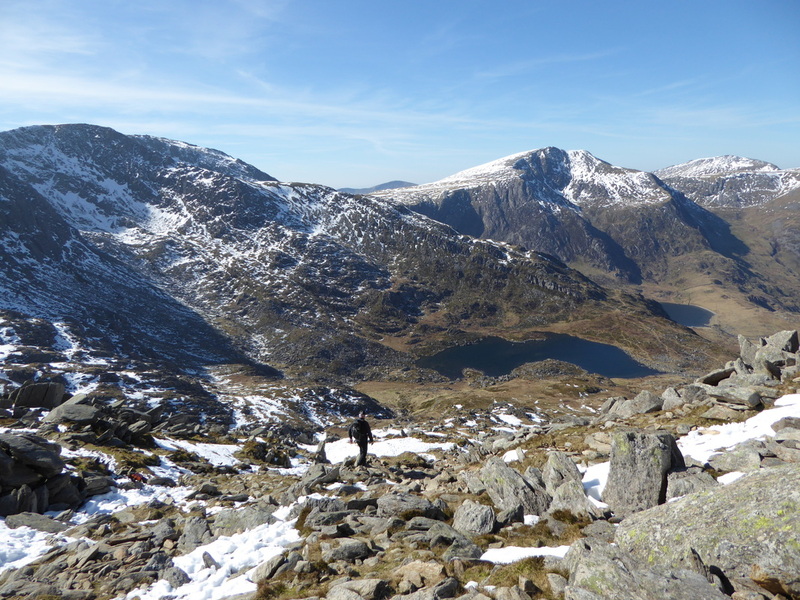 The walk up the valley, with Tryfan's rugged eastern face a constant companion is truly delightful. 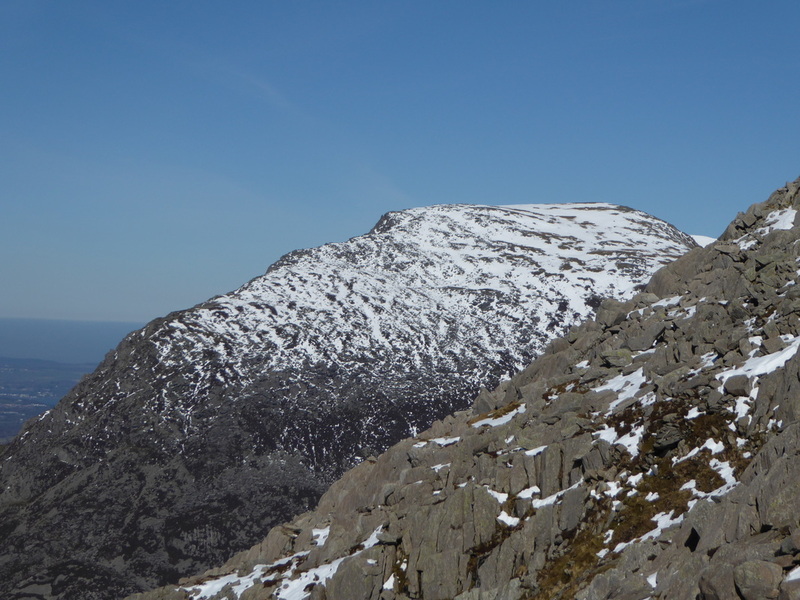 The path rose gently until arriving at the head of the Cwm where we turned right on a steep path to reach a stile at a wall at the top of the col of Bwlch Tryfan - going left takes you up Bristly Ridge on to Glyder Fach and right heads up the South Ridge of Tryfan. 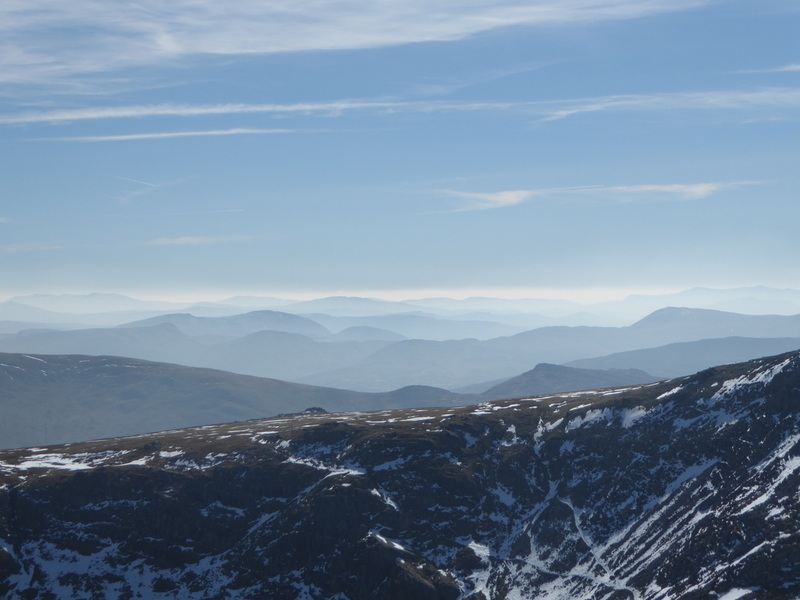 From the col there is a superb view in all directions, particularly down to Llyn Bochlwyd, the Glyderau and over to the Carneddau. 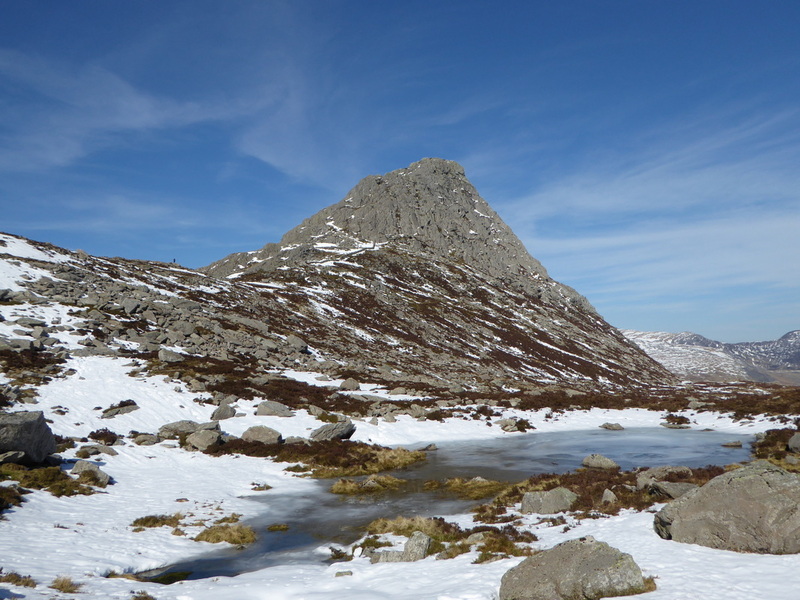 By this time there was snow aplenty and indeed it covered up most of the paths above 400m. 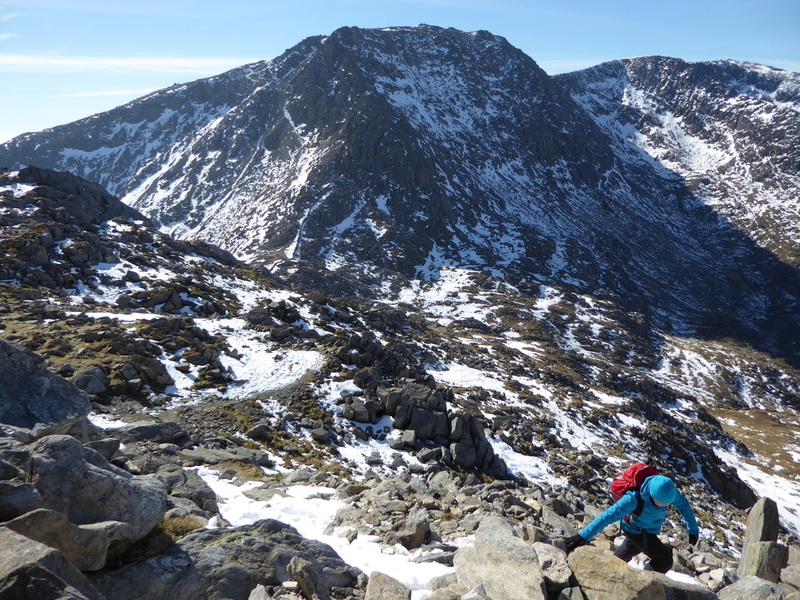 We then began the joyful ascent of the South Ridge which gives excellent scrambling at Grade 1. 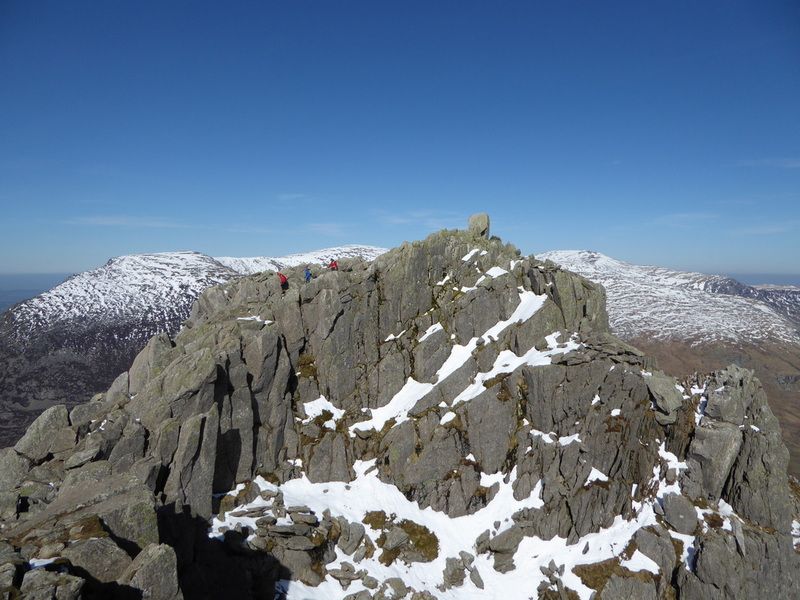 The deep snow sometimes made route selection up the ridge a bit tricky but was not overly difficult - the best thing to do is simply take the time to select the way up and to stop often - appreciating the superb views on offer. 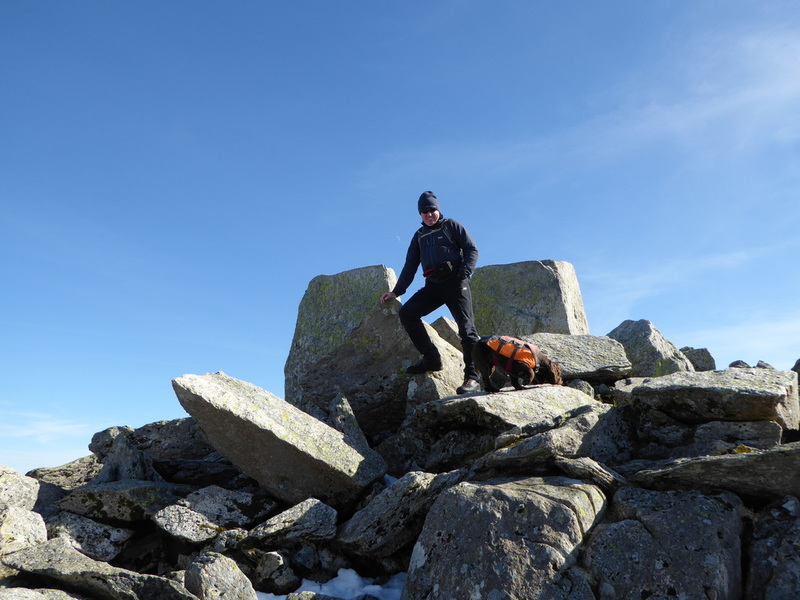 Crossing the Far South Peak we dropped down to a col then made the final push for the summit, reaching the two massive stone monoliths of Adam & Eve which mark the top of this iconic mountain. 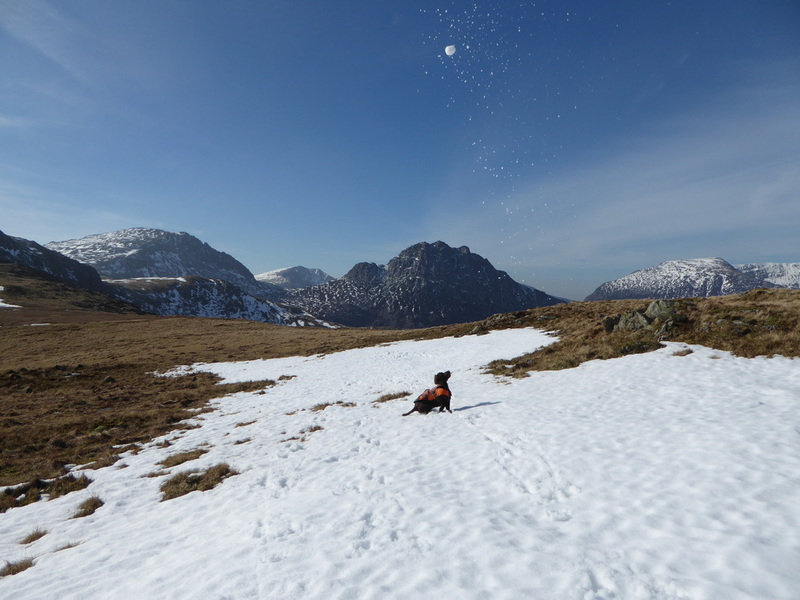 It is normally pretty busy at the summit but today we had it to ourselves for at least a minute before people started arriving! 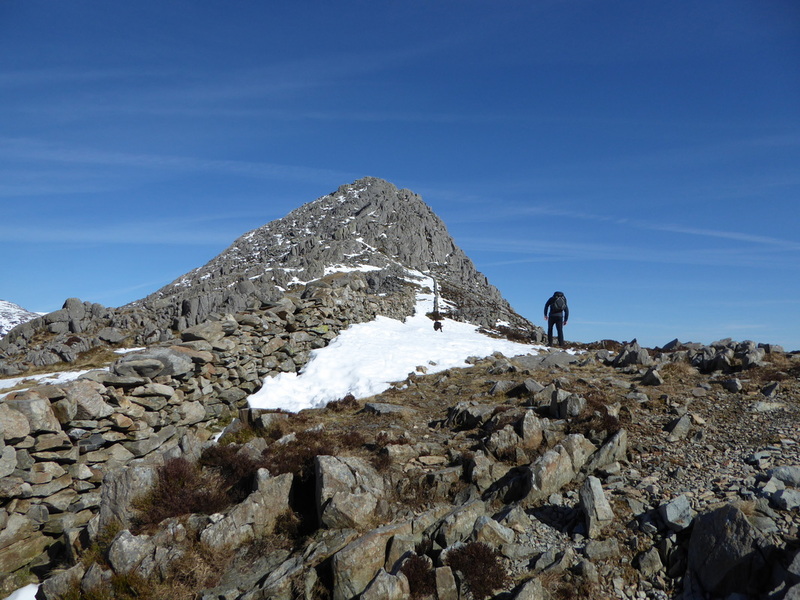 Resisting the urge to jump from Eve to Adam and become Freemen of Tryfan, we dropped back down to Bwlch Tryfan, taking our time and veering off to the west where the going was a little easier before reaching the col once more. 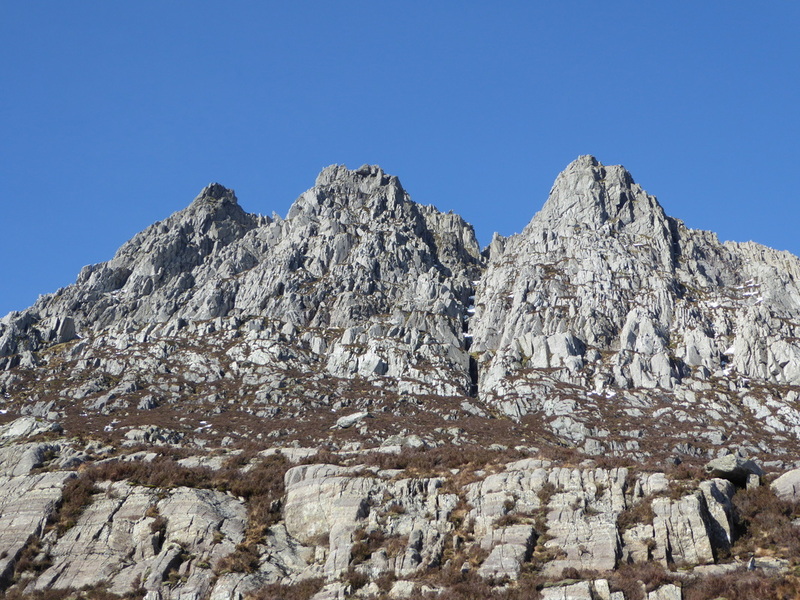 Resisting the temptation to climb up Bristly Ridge we retraced our steps to the head of Cwm Tryfan. 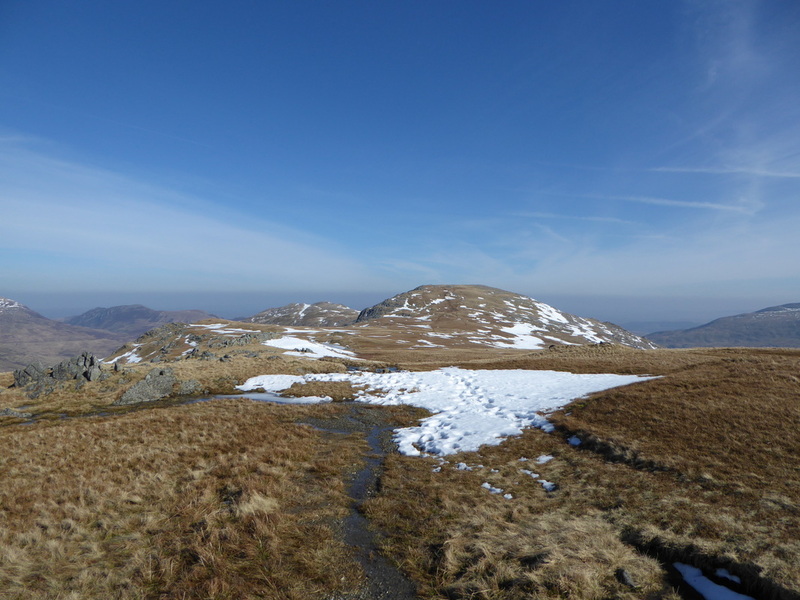 There was now a choice of two routes up on to the ridge that would lead us to Y Foel Goch - either taking the OS marked path slanting gently across the lower slopes of the ridge or taking an unmarked path straight up, quite steeply - we had taken the latter path before therefore took it again. 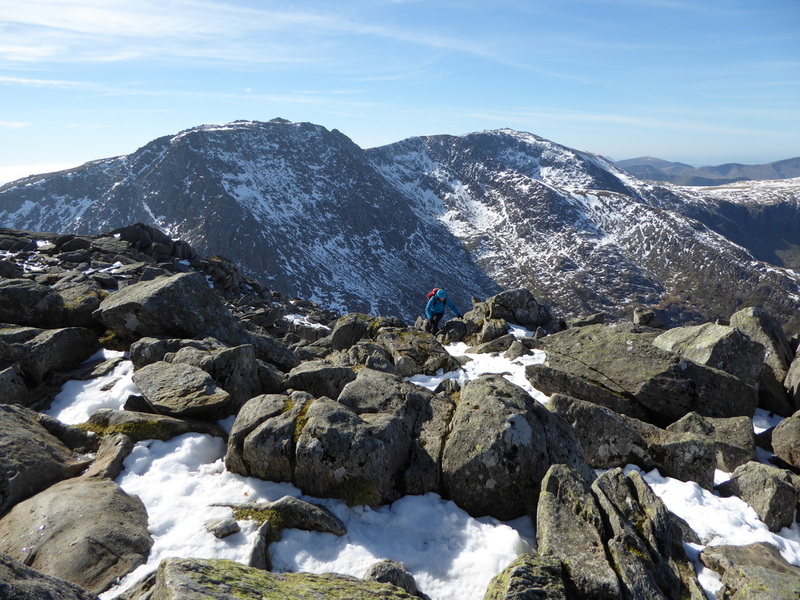 At the top of the ridge we contemplated turning right to climb up the slope to Glyder Fach but instead stuck with the original plan to go left on the delightful grassy transit to Y Foel Goch where the views back to the Glyders, Snowdon, the Carneddau and Moel Siabod really open up. 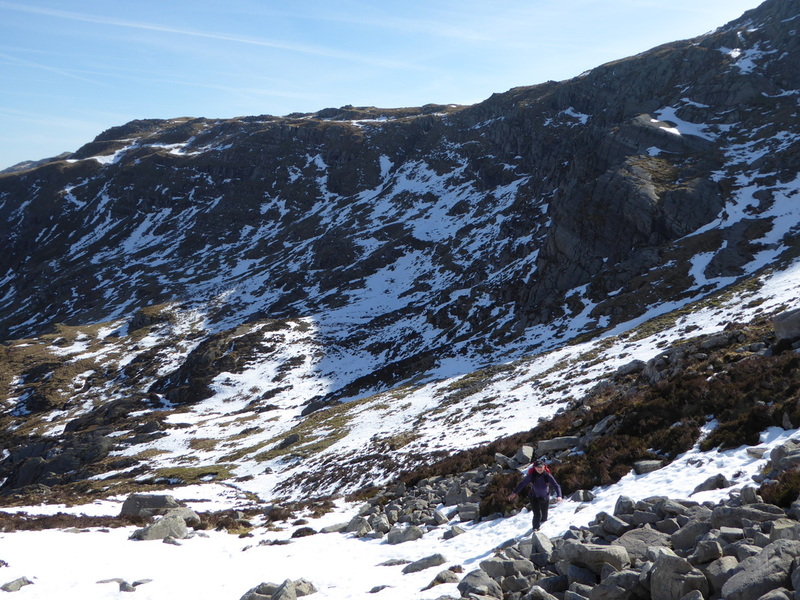 Arriving at Y Foel Goch it took very little effort to reach the summit of Gallt yr Ogof and the next conundrum was which route of descent we would take back to the valley bottom. 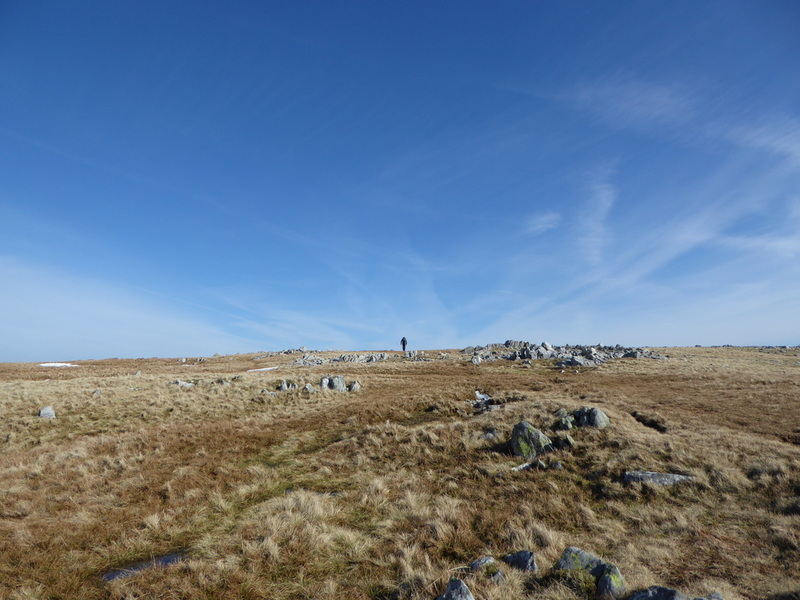 There are two real options - we knew already there were no definitive paths down off the mountain therefore we dropped down, steeply at first into Cwm Gwern Gof before reaching more level ground where a fence led to a stile and a good path to reach the farm at Gwern Gof Isaf. 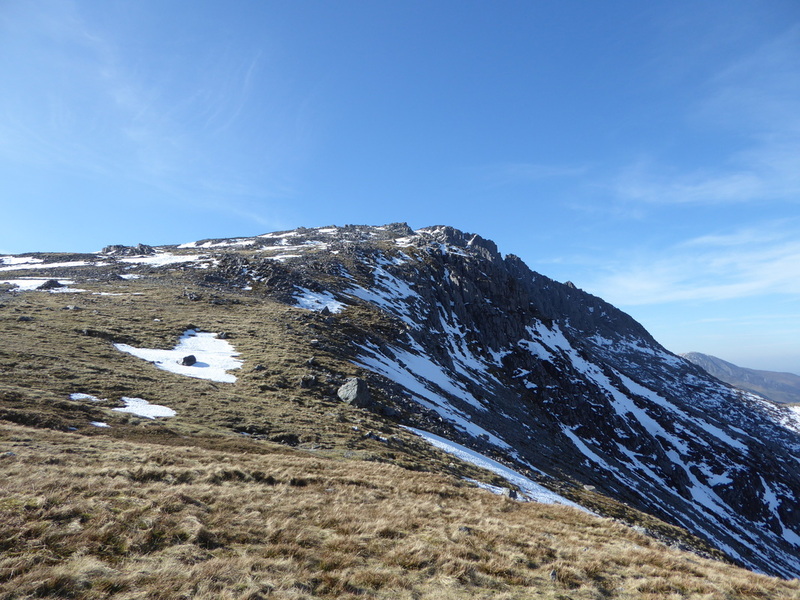 The second option would have been to continue in the same direction over Gallt yr Ogof to descend to the fence and then handrail this to the left and subsequently reach the same stile. 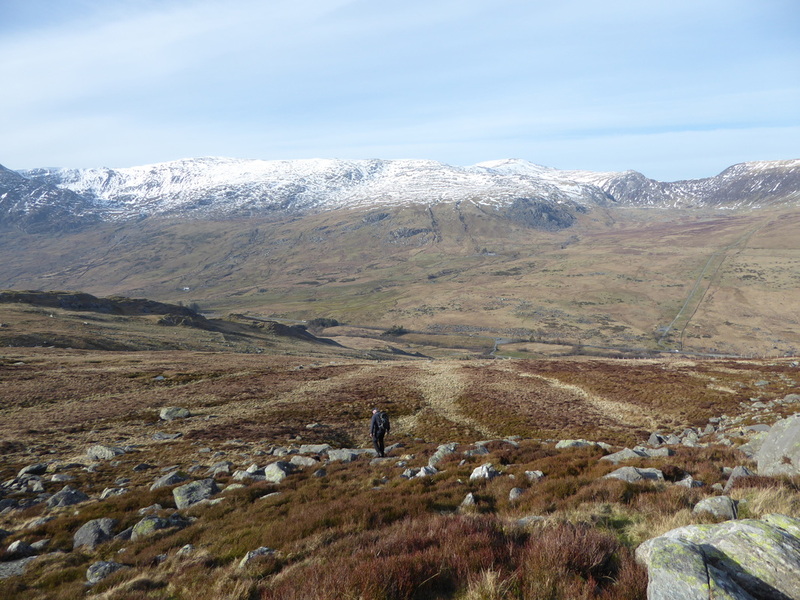 From the farm at Gwern Gof Isaf, it was a simple case of following the good track for about 2 miles back to the start at Gwern Gof Uchaf. 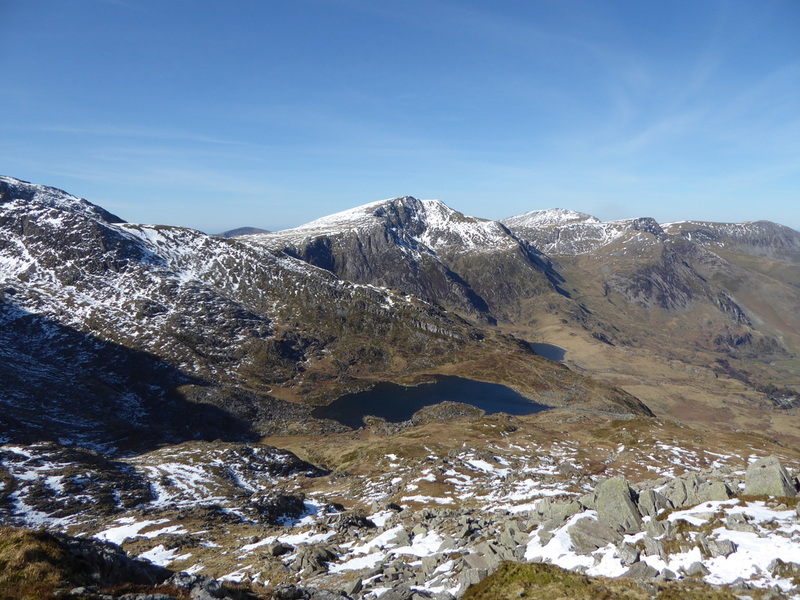 This was a truly memorable day in a superb area of Snowdonia. 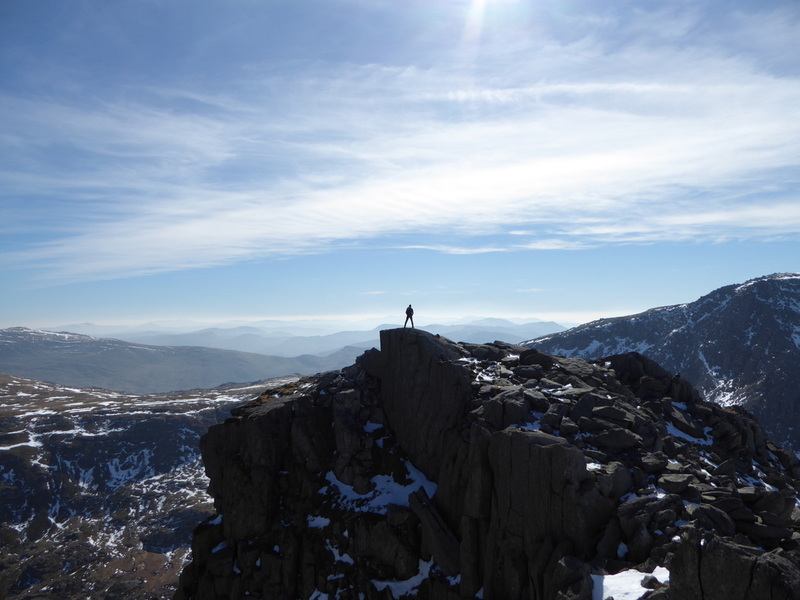 Tryfan has it all and did not disappoint and the other 2 summits provided great views also. 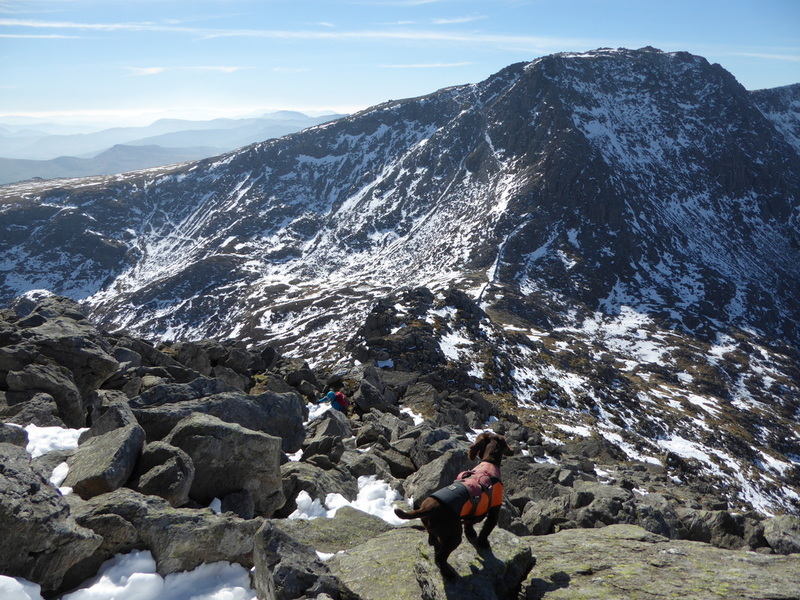 The South Ridge may be a little easier than the North but it is a good and testing scramble all the same. 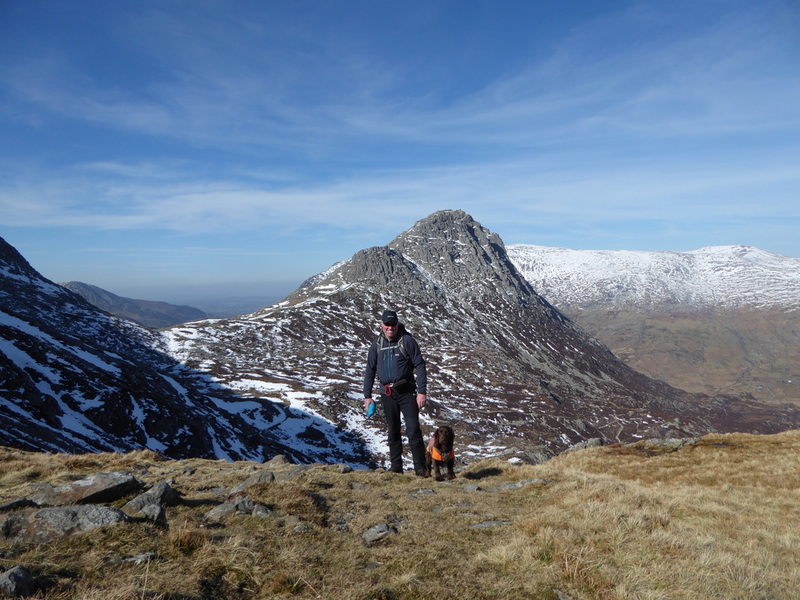 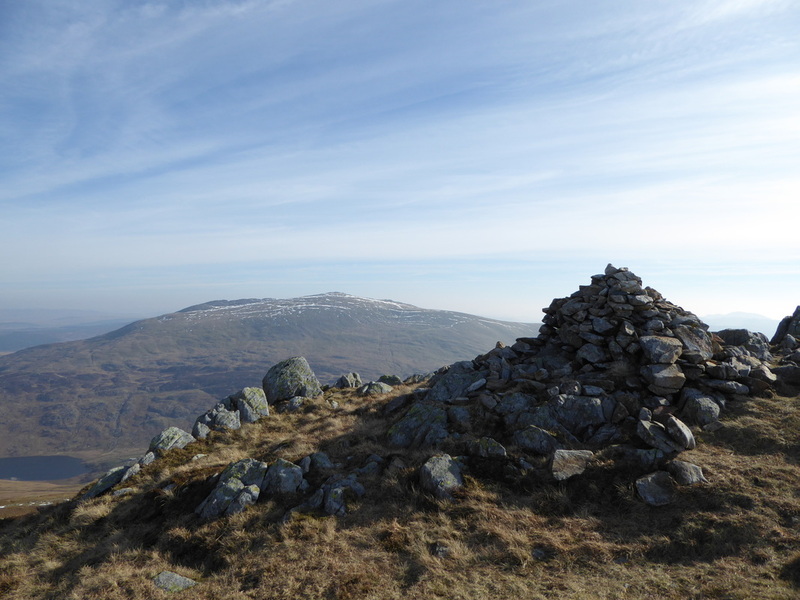 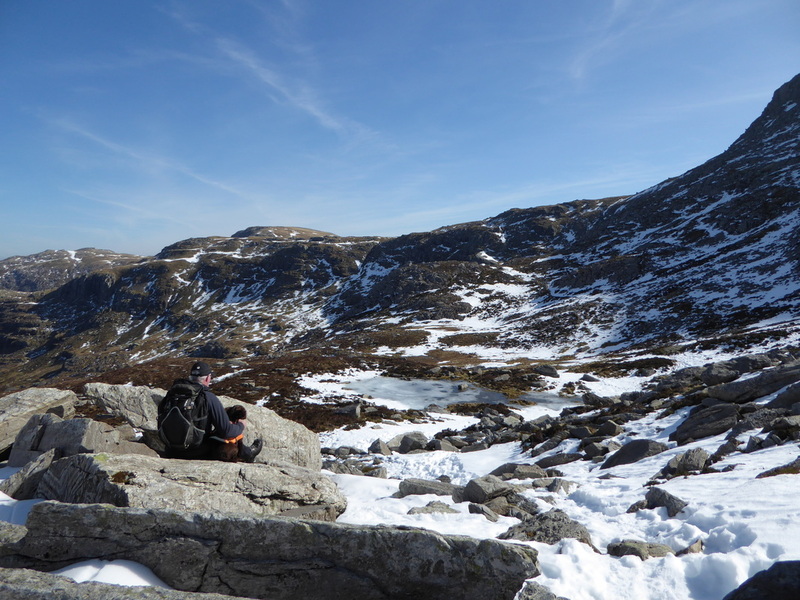 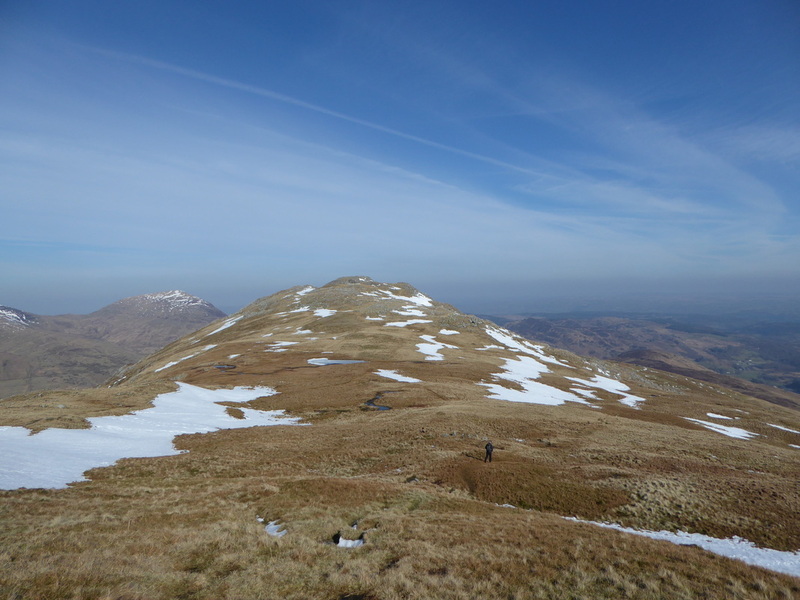 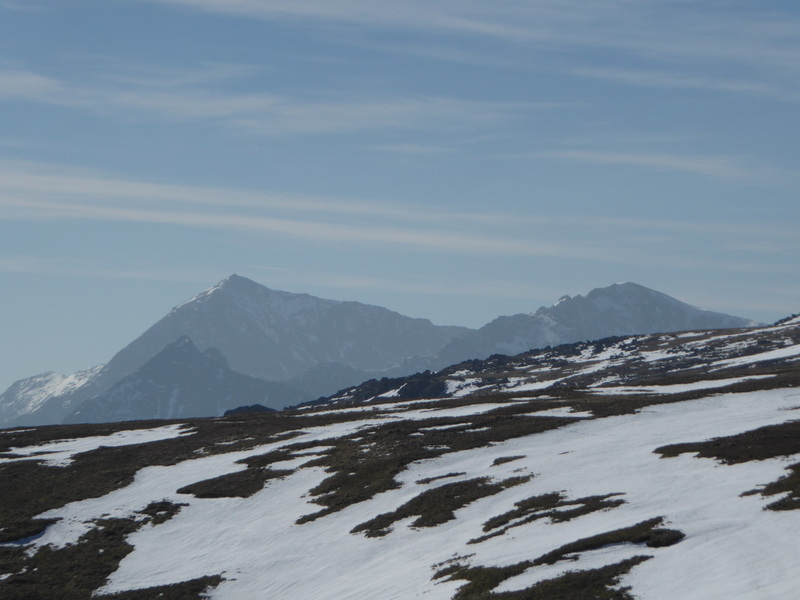 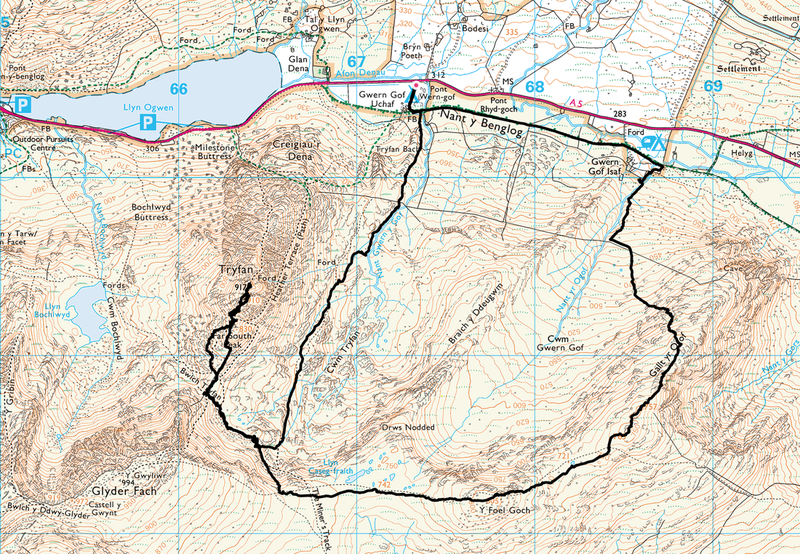 Today had the lot - great weather, good conditions underfoot and a cracking mountain to boot. 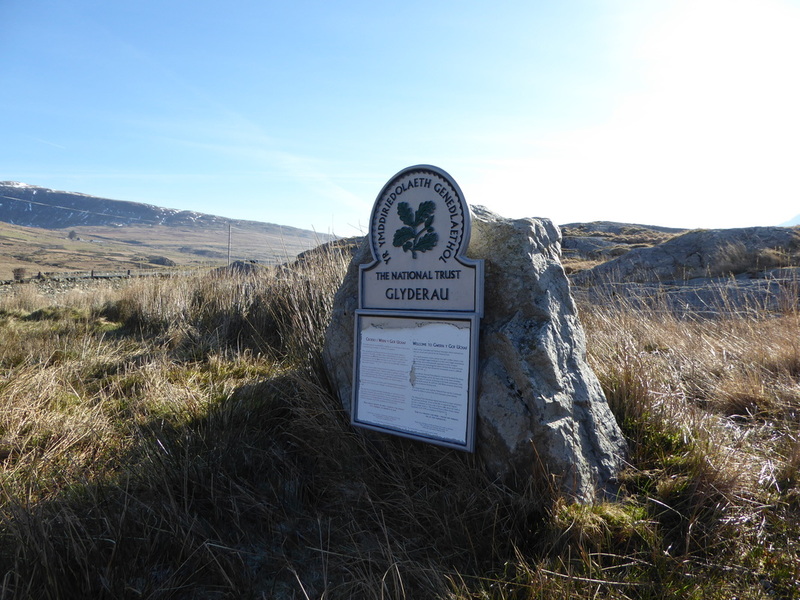 The walk starts from the campsite & farm at Gwern Gof Uchaf - if they are not about just push your £1 through the letter box! 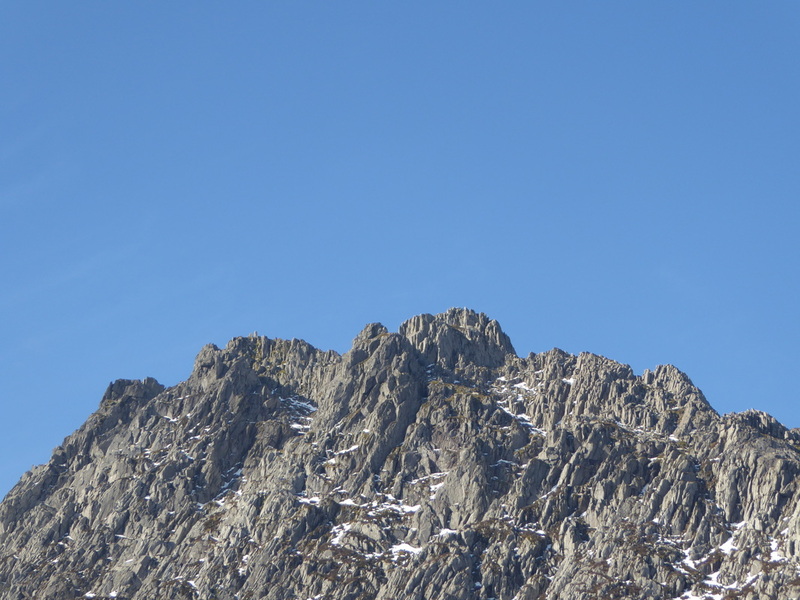 Zooming in on Tryfan showing from L-R the South, Central and North Buttresses. 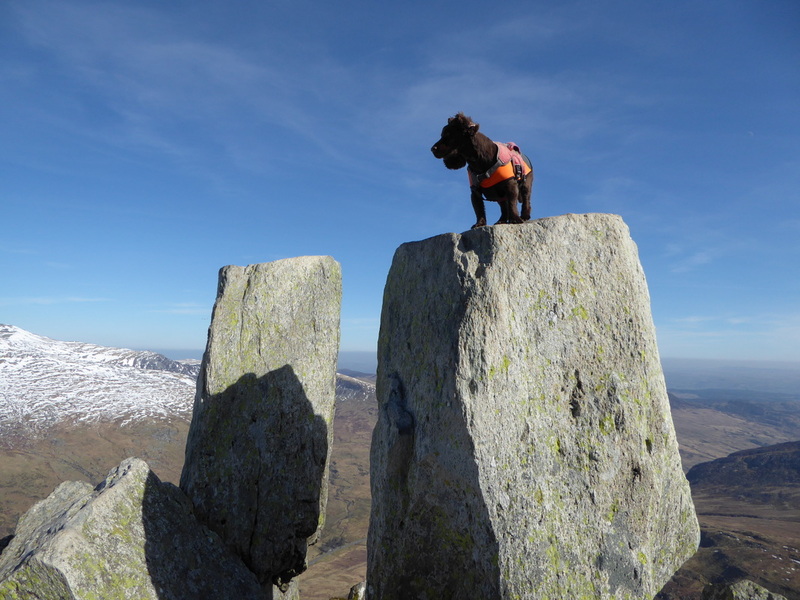 To jump from one to the other apparently gives you the title "Freeman of Tryfan"